Smith, Roger 1988. Does the history of psychology have a subject?. History of the Human Sciences, Vol. 1, Issue. 2, p. 147. 1 E.g. Joynson, R. B., Psychology and common sense. London, 1974. 2 Centenary celebrations included The 22nd International Congress of Psychology at Leipzig: Wetmore, K., ‘A note on the twenty-second International Congress of Psychology’, Journal of the History of the Behavioural Sciences, 1981, 17, 232–5; and the 1979 meeting of the American Psychological Association at New York: D. E. Leary, ‘One hundred years of experimental psychology: an American perspective’, in Bringmann, and Scheerer, (eds), 175–89. See also, the 1977 conference of the New York Academy of Sciences, papers published as R. W. Rieber and K. Salzinger (eds), ‘The roots of American psychology: historical influences and implications for the future’, Annals of the New York Academy of Sciences, 1977, 291; also published (with new chapters) as Rieber, R. W. and Salzinger, K. (eds. ), Psychology: theoretical-historical perspectives. New York, 1980. Cf. Brožek, J., ‘Centennial activities’, in Brožek, J. and Pongratz, L. J. (eds. ), Historiography of modern psychology. Toronto, 1980, 326–30. 3 Psychologists have taken up this point in Buss, A. R. (ed. ), Psychology in social context. New York, 1979; especially Danziger, K., ‘The social origins of modern psychology’, pp. 27–45. 4 Bringmann, W. G., Bringmann, N. J. and Ungerer, G. A., ‘The establishment of Wundt's laboratory: an archival and documentary study’, in Bringmann, and Tweney, (eds), 123–57; cf. Bringmann, W. G. and Ungerer, G. A., ‘The foundation of the Institute for Experimental Psychology at Leipzig University’, in Bringmann, and Scheerer, (eds), 5–18, and (same article) ‘The establishment of Wilhelm Wundt's Leipzig laboratory’, Storia e critica della psicologia, 1980, 1, 11–28. See also: Bringmann, W. G., Bringmann, N. J. and Balance, W. D. G., ‘Wilhelm Maximilian Wundt 1832–1875: the formative years’, in Bringmann, and Tweney, (eds), 13–32; Bringmann, W. G., Ungerer, G. A. and Ganzer, H., ‘Illustrations from the life and work of Wilhelm Wundt’, ibid., 329–59. It is reported that W. G. Bringmann is writing a biography. Materials from the Leipzig archive are used in the general biographical introduction, written in the DDR: Meischner, W. and Eschler, E., Wilhelm Wundt. Köln, 1979. The standard Wundt bibliography is Wundt, E. (ed. ), Wilhelm Wundts Werk: ein Verzeichnis seiner sämtlichen Schriften. München, 1927. See also Bringmann, W. G. and Ungerer, G. A., ‘An archival journey in search of Wilhelm Wundt’, in Brožek, J. and Pongratz, L. J. (eds. ), Historiography of modern psychology. Toronto, 1980, 201–40. 5 Diamond, S., ‘Wundt before Leipzig’, in Rieber, (ed. ), 3–70. 6 Boring, E. G., A history of experimental psychology. 2nd edn., New York, 1950, p. 344. 7 Marshall, M. E. and Wendt, R. A., ‘Wilhelm Wundt, spiritism, and the assumptions of science’, in Bringmann, and Tweney, (eds), 158–75. 8 With little excuse: C. H. Judd translated Wundt's Grundriss der Psychologie (1896) in an edition approved by Wundt and printed by his publisher (and subsequently reprinted): Outlines of psychology. Leipzig, 1897. Wundt makes clear his grandiose but challenging philosophical project in ch. 1. Theodore Mischel pioneered serious reconsideration in, ‘Wundt and the conceptual foundations of psychology’, Philosophy and Phenomenological Research, 1970, 31, 1–26. 9 Richards, R. J., ‘Wundt's early theories of unconscious inference and cognitive evolution in their relation to Darwinian biopsychology’, in Bringmann, and Tweney, (eds), 42–70; van Hoorn, W. and Verhave, T., ‘Wundt's changing conceptions of a general and theoretical psychology’, ibid., 71–113; Danziger, K., ‘Wundt's theory of behavior and volition’, in Rieber, (ed. ), 89–115. Cf. Scheerer, E., ‘Wilhelm Wundt's psychology of memory’, in Bringmann, and Scheerer, (eds), 135–55. 10 Diamond, S. (trans., with commentary notes), ‘Selected texts from writings of Wilhelm Wundt’, in Rieber, (ed. ), 155–77. 11 As Danziger, K., ‘Wundt and the two traditions in psychology’, in Rieber, (ed. ), 73–87 (75–82), points out, Wundt's discussion of ‘mental mechanism’ was a response to Herbart; the English ‘influence’ was on Titchener rather than Wundt. Inattention to this distinction confuses Boring's discussion of Wundt: op. cit. note 6, esp. pp. 329, 336. Boring's account is discussed in Blumenthal, A. L., ‘Wilhelm Wundt problems of interpretation’, in Bringmann, and Tweney, (eds), 435–45. 12 Rappard, H. V., Psychology as self-knowledge: the development of the concept of the mind in German rationalistic psychology and its relevance today. Trans. L. Faili, Assen, 1979, eh. 4; reworked as, ‘A monistic interpretation of Wundt's psychology’, in Bringmann, and Scheerer, (eds), 123–34. 13 Cf. van Hoorn, and Verhave, , op. cit. note 9, pp. 92, 94; Danziger, K., ‘Wundt's psychological experiment in the light of his philosophy of science’, in Bringmann, and Scheerer, (eds. ), 109–22 (esp. 115); idem, ‘The history of introspection reconsidered’, Journal of the History of the Behavioral Sciences, 1980, 16, 241–62; Sokal, , Cottell, 10. 14 Haeberlin, H. K., ‘The theoretical foundations of Wundt's folk psychology’ (1916), in Rieber, (ed. ), 229–49; reprinting such reviews, without discussing their context, limits their use. 15 van Hoorn, and Verhave, , op. cit. note 9, pp. 100–5. Dilthey's major discussion of psychology (1894) has recently been translated: Dilthey, W., Descriptive psychology and historical understanding. Trans. Zaner, R. M. and Heiges, K. L., The Hague, 1977, ‘Ideas concerning a descriptive and analytic psychology’, pp. 21–120. 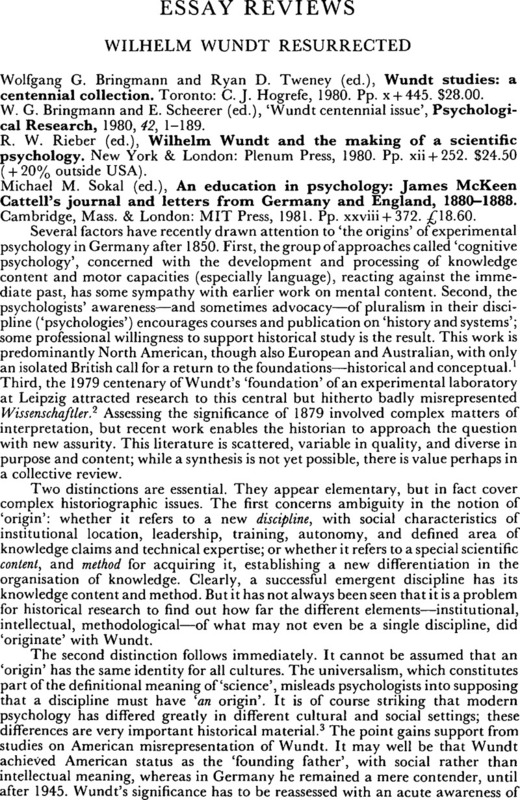 16 Ash, M. G., ‘Wilhelm Wundt and Oswald Külpe on the institutional status of psychology: an academic controversy in historical context’, in Bringmann, and Tweney, (eds. ), 396–421; idem, ‘Experimental psychology in Germany before 1914: aspects of an academic identity problem’, in Bringmann, and Scheerer, (eds), 75–86. Cf. Danziger, K., ‘The positivist repudiation of Wundt’, Journal of the History of the Behavioral Sciences, 1979, 15, 205–30; Bringmann, W. G. and Ungerer, G. A., ‘Experimental vs. educational psychology: Wilhelm Wundt's letters to Ernst Meumann’, in Bringmann, and Scheerer, (eds), 57–73. 17 In particular, the often cited study of role hybridisation, Ben-David, J. and Collins, R., ‘Social factors in the origins of a new science: the case of psychology’, American Sociological Review, 1966, 31, 451–65, should be buried. 18 Blumenthal, A. L., ‘Wilhelm Wundt and early American psychology: a clash of two cultures’, in Rieber, (ed. ), 117–35; same article in Rieber, and Salzinger, , op. cit. note 2, pp. 25–42. Cf. Danziger, , op. cit. note 11; idem, op. cit. note 3. 19 Cf. Dolby, R. G. A., ‘The transmission of two new scientific disciplines from Europe to North America in the late nineteenth century’, Annals of Science, 1977, 34, 287–310. 20 Titchener's much quoted 1921 obituary of Wundt is reprinted in Bringmann, and Tweney, (eds. ), 309–25. Cf. Dazzi, N. and Ferruccio, F., ‘Wundt, Titchener e la psicologia americana’, Storia e critica della psicologia, 1980, 1, 29–52; Tweney, R. D. and Yachanin, S. A., ‘Titchener's Wundt’, in Bringmann, and Tweney, (eds. ), 380–95; also, note 18, and Danziger, , op. cit. note 16. 21 On American experiences of Wundt: Sokal, M. M., ‘Graduate study with Wundt: two eyewitness accounts’, in Bringmann, and Tweney, (ed), 210–25 (on J. McKeen Cattell and G. M. Stratton); Bringmann, N. J. and Bringmann, W. G., ‘Wilhelm Wundt and his first American student’, ibid., 176–92 (on G. Stanley Hall); Sexton, V. S., ‘Edward Aloysius Pace’, in Bringmann, and Scheerer, (eds), 39–47 (Pace introduced Wundt to American catholics, through the Catholic University of America in Washington, DC). The 1921 memorial collection from Wundt's American students is hopelessly anecdotal: Baldwin, B. T. (ed. ), ‘In memory of Wilhelm Wundt’, in Bringmann, and Tweney, (eds), 280–308. 22 Sokal, , Cattell, 218–313. Cf. Hearnshaw, L. S., A short history of British psychology, 1840–1940. London, 1964; Daston, L. J., ‘British responses to psycho-physiology, 1860–1900’, Isis, 1978, 69, 192–208. 23 Hillix, W. A. and Broyles, J. W., ‘The family trees of American psychologists’, in Bringmann, and Tweney, (eds. ), 422–34 (424, 425). 24 This relationship does emphasise new historical materials: Wundt, W., The language of gestures. Intro, by A. L. Blumenthal, and additional essays by Mead, G. H. and Bühler, K., The Hague, 1973. Cf. Popplestone, J. A. and McPherson, M. W., ‘The vitality of the Leipzig model of 1880–1910 in the United States in 1950–1980’, in Bringmann, and Tweney, (eds), 226–57; Marks, L. E., ‘Psychophysical judgement: Wundt's theory revisited’, in Bringmann, and Scheerer, (eds), 157–64; Pfaffmann, C., ‘Wundt's schema of sensory affect in the light of research on gustatory preferences’, ibid., 165–74; Leahey, T. H., ‘Something old, something new: attention in Wundt and modern cognitive psychology’, Journal of the History of the Behavioral Sciences, 1979, 15, 242–52. 25 Nilsson, A., ‘Alfred Lehmann and psychology as a physical science’, in Bringmann, and Tweney, (eds), 258–68; Misiak, H., ‘Leipzig and Louvain University in Belgium’, in Bringmann, and Scheerer, (eds), 49–56. M. A. Tinker's 1932 list of Wundt's doctoral students and their theses is reprinted in Bringmann, and Tweney, (eds), 269–79. For Wundt's first ‘psychological’ thesis: Behrens, P. J., ‘The first dissertation in experimental psychology: Max Friedrich's study of apperception’, ibid., 193–209; idem, ‘An edited translation of the first dissertation in experimental psychology by Max Friedrich at Leipzig University in Germany’, in Bringmann, and Scheerer, (eds. ), 19–38. 26 ‘Preface’ in Bringmann, and Tweney, (eds), p. 5.